Art Deco Freshwater Peach Pink Coin Pearl Bracelet with Flower Design T-bar Clasp - The unusual Pearl shape has an artistic quality, which looks and feels rich and stylish. This bracelet is made to order. 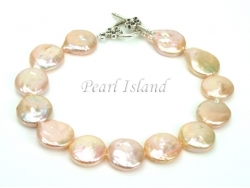 It means you can have your preferred length and design, please email us: service@pearlisland.co.uk.